Thank you for purchasing Platform, Disruption, Wave! Platform disruption is the new game in town. The global economy is restructuring around super-corporations running modern business platforms causing older companies and incumbents to feel the chill wind of disruptive competition. Companies that fail to adapt to the platform shift are disappearing, while those that do are reshaping their fortunes and securing monopoly positions. 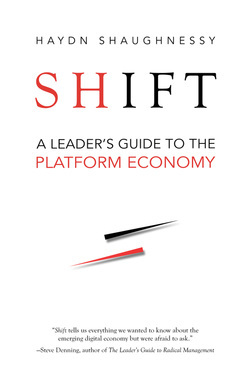 Shift is critical reading on the platform revolution. To ensure you and your company are adapting appropriately in uncertain times you need to understand the new business platform. Whether you are a business leader or an employee, a freelance or small business owner you are sure to find unique value in the insights from Shaughnessy's observation on an economy in flux. Designing for Tranformation: Stories principles and practical ways in which business & organisations can innovate to a better future. ​Alan Moore possesses a unique grasp on the changes that are reshaping our world, on how to transform organisations and businesses. Alan has worked with many leading educational and corporate institutions around the world, sharing his extensive knowledge and insights on innovation and transformation. He is offering an overview of his major work on change, No Straight Lines, and an essay on transformation. ​Chunka Mui is the author of three books on strategy and innovation. He is also the managing director of the Devil’s Advocate Group, a consultancy that helps large companies design and stress test their innovation strategies. Chunka’s latest book is The New Killer Apps: How Large Companies Can Out Innovate Start-Ups. Chunka’s first book was the best-selling Unleashing the Killer App: Digital Strategies for Market Dominance. In 2005, The Wall Street Journal named that book one of the five best books on business and the Internet. Inc. named his 2008 book, Billion-Dollar Lessons: What You Can Learn from the Most Inexcusable Business Failures of the Last 25 Years, one of the best business books of that year. You’ll find a lengthy abstract from Killer Apps, here. ​Kare Anderson is an Emmy-winning former NBC and Wall Street Journal reporter, now a speaker and Forbes and Huffington Post contributor on connective communications. She’s also TED and TEDx speaker on Opportunity Makers and the mutuality mindset. She is the author of Mutuality Matters and CEO at Say it Better Center. She blogs on Moving From Me to We. Kare has written a post on how to persuade other people into more mutual behavior. ​Ross Dawson is globally recognized as a leading futurist, entrepreneur, keynote speaker, strategy advisor and bestselling author. You can see more of his work at www.rossdawson.com. 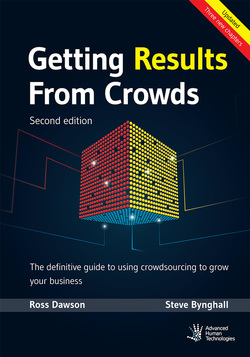 Ross is also an expert in how the crowd will impact on business so here writes about getting results from crowds. Steve Denning is one of the foremost authorities on leadership for the emerging economy. Through his Forbes column and books such as The Leaders’ Guide to Radical Management, Steve has established himself as a pioneering voice for change. 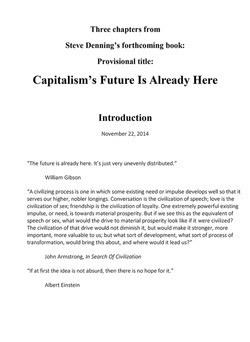 Here he shares, exclusively, 3 chapters from his new book: Capitalism’s Future. 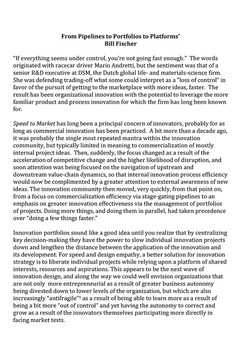 Bill Fischer is a Professor of Innovation Management at IMD business school, Switzerland. He co-founded and co-directs the IMD program on Driving Strategic Innovation, in cooperation with the Sloan School of Management at MIT and also authors a regular column for Forbes.com entitled “The Ideas Business.” Bill is a leading expert in platform business and innovation and has developed some great cases from his career-long studies of innovation in China. Read more about China platform strategy.